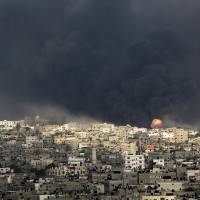 JERUSALEM/GAZA CITY, GAZA STRIP - Hamas’s armed wing said on Sunday it had captured an Israeli soldier, as fighting in Gaza led to the bloodiest losses in a nearly two-week military offensive, with some 100 Palestinians and 13 Israeli soldiers killed. The Israeli military said it was checking on the reported capture, which was announced in a Hamas television broadcast. Israeli television stations ignored the report in their extended evening programming about the offensive. “Qassam Brigades captured a Zionist soldier,” said Abu Ubaida, the masked spokesman of the Izzedine al-Qassam brigades, the armed wing of Hamas, who identified the soldier as Shaul Aron and recited what he said was Aron’s identity tag number. Ubaida said the capture happened during the same battle in which 13 Israeli soldiers died earlier, near Shejaia, the embattled neighborhood east of the city of Gaza where most of the Palestinian casualties occurred on Sunday. The one-day death toll was the highest for the Israeli military’s since a 2006 war against Hezbollah guerrillas in Lebanon. It also represented the most Palestinians killed since fighting began on July 8. If confirmed, Aron would be the first Israeli soldier held captive in Gaza since 2011, when Israel released about 1,000 Palestinian prisoners to free Gilad Shalit, a soldier who was held for more than five years after his 2006 capture in a cross-border raid. Cries of celebration and fireworks were heard around Gaza shortly after the Hamas broadcast Sunday. Palestinian President Mahmoud Abbas accused Israel of carrying out a massacre in Shejaia and declared three days of mourning. Israel’s army said it had been targeting militants from Gaza’s dominant Hamas group, whom it alleged had fired rockets from Shejaia and built tunnels and command center there. The army said it had warned locals two days earlier to leave. Army sources said seven of the 13 Israeli soldiers were in an armored personnel carrier hit by anti-tank fire. Others were killed setting up positions inside houses they had taken over, the sources added. Authorities and family members also said two Americans who were soldiers with the Israeli military were among those killed. Stuart Steinberg confirmed the death of his 24-year-old son, Max Steinberg, on Sunday. Steinberg, whose family lives in California, was a sharpshooter for the Golani Brigade. Earlier Sunday, the Israeli military said in a statement that 21-year-old Sgt. 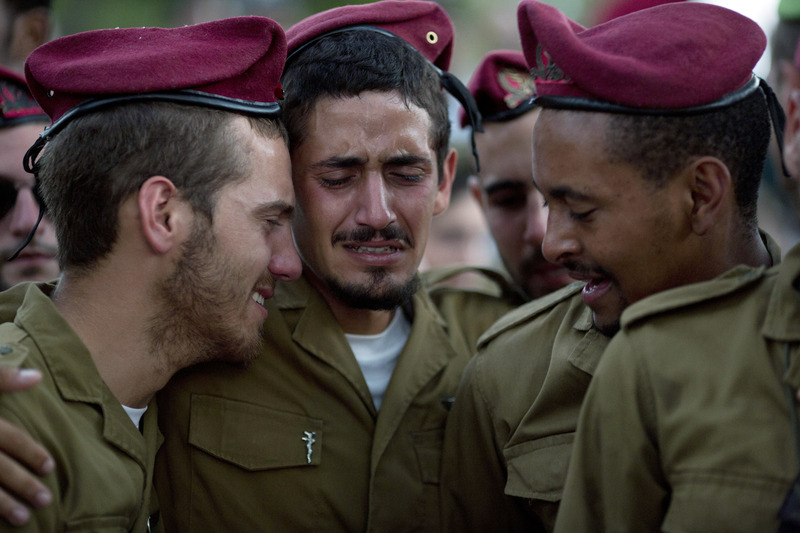 Nissim Sean Carmeli was killed in combat in the Gaza Strip. Deputy Israeli Consul General Maya Kadosh said Carmeli was from Texas. Residents fled Sunday’s fighting along streets strewn with bodies and rubble, many of them taking shelter in Gaza’s Shifa Hospital. Cries of “Did you see Ahmed?” “Did you see my wife?” echoed through the courtyard. Inside, dead and wounded lay on bloodstained floors. Shifa Hospital Director Naser Tattar said 17 children, 14 women and four elderly were among 62 Palestinians killed, and about 400 people were wounded in the Israeli assault. Gaza’s Health Ministry said 37 other Palestinians were also killed Sunday, bringing the Gaza death toll since an Israeli air and naval bombardments began on July 8 to at least 434, many of them civilians. Some 2,600 Palestinians have been wounded, it said. 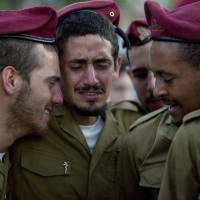 Eighteen Israeli soldiers and two Israeli civilians have been killed since the launch of the offensive, which expanded on Thursday into a ground push, following mounting cross-border rocket attacks by militants. 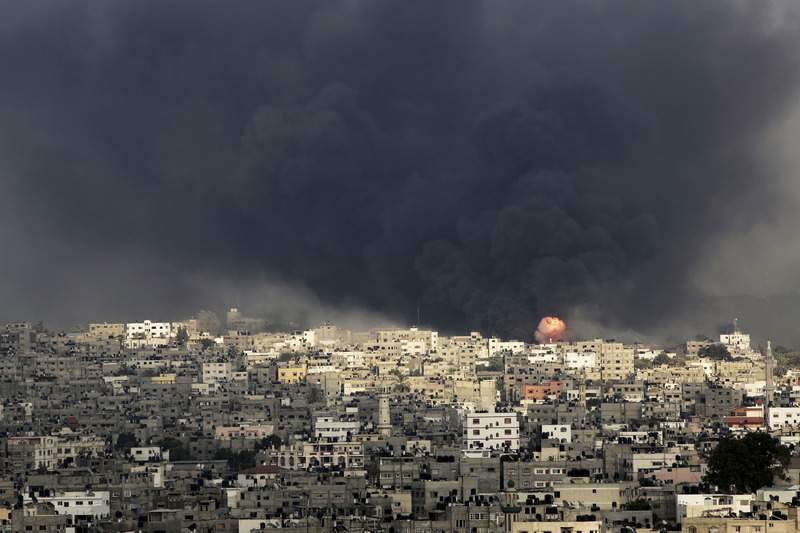 Palestinian fighters kept up their rocket fire on Israel on Sunday. Sirens sounded in southern Israeli towns and in the Tel Aviv metropolitan area. There were no reports of casualties from those salvos. In a telephone conversation with Israeli Prime Minister Benjamin Netanyahu — their second in three days — U.S. President Barack Obama “raised serious concern about the growing number of casualties” on both sides of the conflict, the White House said. Netanyahu, addressing a news conference in Tel Aviv after the military released news of the soldiers’ deaths, pledged to press on with the campaign with the goals of “restoring quiet” while “significantly” damaging Hamas and other militant groups’ infrastructure in Gaza. “We are undeterred. We shall continue the operation as long as is required,” Netanyahu said. U.S. Secretary of State John Kerry was traveling to Cairo on Monday to meet with Egyptian officials about the crisis, U.S. State Department spokeswoman Jen Psaki said in a statement, adding that the United States was deeply concerned about the risk of further escalation and was pushing for a cease-fire. Earlier Sunday, Kerry said he supported Israel’s efforts to destroy tunnels it says Gaza militants use for infiltration attempts and to hide weaponry. “We support Israel’s right to defend itself against rockets that are continuing to come in,” Kerry told Fox News. Video given to Reuters by a local showed at least a dozen corpses, including three children, lying in streets, though the footage could not be verified independently. As the tank shells began to land, Shejaia residents called radio stations pleading for evacuation. An airstrike on the Shejaia home of Khalil al-Hayya, a senior Hamas official, killed his son, daughter-in-law and two grandchildren, hospital officials said. Hamas’s armed wing said it used land mines and roadside bombs against advancing Israeli tanks and armored personnel carriers. “As we moved into Shejaia we were met by anti-tank missiles, RPGs (rocket-propelled grenades), heavy, extensive weapons fire at the forces from the houses, from the surrounding buildings,” said Lt. Col. Peter Lerner, an Israeli military spokesman. Israeli Defense Minister Moshe Yaalon said some of the Israeli firepower was unleashed to try to extricate soldiers who had come under attack. The Israeli military said it beefed up its presence Sunday, with a focus on destroying missile stockpiles and the vast tunnel system Hamas built along the frontier with Israel. “I estimate that within two or three days the major part of the tunnels will have been destroyed,” Yaalon said at the news conference where Netanyahu also spoke. Netanyahu has accused Hamas of using noncombatants as human shields, and he told CNN the army was concentrating on military targets. Egypt, Qatar, France and the United Nations, among others, have all been pushing, with little sign of progress, for a permanent cease-fire in the worst surge of Israeli-Palestinian fighting in two years. Qatar was due to host a meeting between Abbas and U.N. Secretary-General Ban Ki-moon on Sunday, a senior Qatari source said. Speaking in Doha, Ban described the fighting in Gaza as an “open wound and we must stop the bleeding now.” He was due to travel to Kuwait, Egypt, Israel, the Palestinian Territories and Jordan during the week, a U.N. statement said. The Qatari source said Abbas would also meet Hamas leader Khaled Mashaal. The Western-backed Abbas in April struck a reconciliation deal with Hamas, which seized the Gaza Strip in 2007 from forces loyal to his Fatah movement. The agreement led to the formation of a Palestinian unity government and Israel’s pullout from U.S.-brokered peace talks. Hamas has already rejected one Egyptian-brokered truce, saying any deal must include an end to a blockade of the coastal area and a recommitment to a cease-fire reached after an eight-day war in Gaza in 2012. Hostilities escalated following the killing last month of three Jewish students that Israel blames on Hamas. Hamas neither confirmed nor denied involvement.